It’s just so satisfying when something comes out better than one expected. For owners Jim Sizemore & Greg Fulton and their team at RV Outfitters, customer satisfaction drives the outcome of their work to be the best possible job in RV renovations. 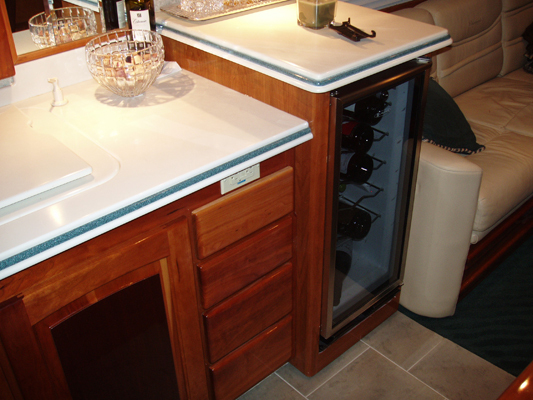 When custom motor home cabinets are ordered, it should be fitted and finished seamlessly, and that is the quality that keeps coaches and travelers coming back to RV Outfitters and making plans for additional work. 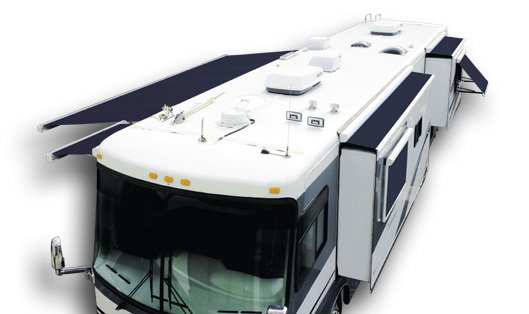 Simply put, there is no one else that will do your recreational vehicle renovation as well as the folks at RV outfitters. It wasn’t just one or two additions that brought Tom and Marcia to RV Outfitters. They were very close to purchasing a new Beaver Marquis, but even the new ones didn’t have the design features they were wanting. As they made their plans and budget with Jim, features were planned to make the interior more functional in the kitchen area as well as exterior changes that Tom saw as necessary for their comfort. Greg Fulton worked to custom build walnut cabinetry for an expanded pantry cabinet and additional space was added for personal items, books, and a flat-screen TV. In the kitchen area, the stove and oven were set with duct work to exhaust to the exterior of the coach. With this extensive rebuilding, Tom said that, "The workmanship was flawless. I am an architect and pay attention to how things fit." He gave high praise to the professional color matching and the uniform look that was achieved. Yet, with his "long laundry list of items" to change, to him the most significant feature on the outside were the awning changes. The manual awnings were replaced with Girard power awnings and slide-out topper ones. "No more ducking to avoid the brackets on the patio awning," said Tom, "and we are now able to adjust the eave height of the window awnings to block the sun and preserve the view at the touch of a button." With more upgrade plans with RV Outfitters to replace carpet, ceramic tile changes, granite counter tops, and a leather hide-a-bed to add to their enjoyment while traveling, coming back for the work is anticipated, because "they accommodated our schedule. He was on time, on budget, and delivered flawless workmanship inside and out." The amenities desired can be added to personalize any RV, coach, or travel trailer so that it reflects personal needs and life-style. Whether a wine cabinet, entertainment center, or a computer desk would make life more comfortable, it can be built in and added to match and create the desired and uniform addition. How pleasant that there are outfitters like Jim and the guys who excel in creating RV owner satisfaction. When Tom and Joanne made their plans with RV Outfitters, it was decided that a central location in the forward area of the coach would provide the best viewing experience. Tom said he just stepped back and let them get on with their work and stayed out of their way. When I spoke with him, he was sitting and enjoying watching TV. After having run down the west coast and escaping the cold that was just behind them, he was relaxing with the afternoon news, an easy choice while waiting to go to dinner with friends. Customer Testimonial"Jim does what he says he will do. His work is completed in a timely manner and he sticks to his estimates."